Over the past couple of months myself and the rest of the team at Shift, along with our friends from Active Partners Trust have been lucky enough to delve into the fascinating world of reflective practice. Reflective practice was introduced to me by Jo Wainwright – a coach, facilitator and mentor from Sheffield and it’s one of the most useful tools I’ve come across so far in our work on systems change. After two sessions the learning I’ve experienced has been quite profound. So much so I’ve been moved to write poetry for the first time. More of that later! John Dewey, an American philosopher (1859-1952) proposed that human experiences are the outcomes of a range of interacting processes and are thus worldly events. The challenge to human life, therefore, is to determine how to live well with processes of change, not somehow to transcend them. We’re not short of literature to explain and understand why systems change is needed and how to do it. Sport England recently compiled a reading list to support people immersed in this work, particularly those in the Local Delivery Pilots, for whom system change is critical to increasing levels of physical activity amongst the population. For the disrupters amongst us, mobilising people around change is not always the challenging part of the work. There are people scattered across the system who are up for this and inspired to experiment, collaborate and work differently for better outcomes. They’re not always easy to find and necessarily brave enough to leap into this space, but once the first followers emerge, others seem to be attracted and the momentum grows. For me, the more challenging part of the work is living with the tension and discomfort which often arises with (systems) change – whether at a micro or macro level. I don’t necessarily mean my own discomfort, but that which consumes the whole system and everyone in it during the change process. For the past few years I’ve been hugely grateful for the generosity of the experienced folk around me who’ve shared their stories of social change and provided tools to help me navigate my way through ‘the mess’. The reflective practice learning has focussed on a number of different theories. The first being Schon’s model of reflective practice which talks about two ways of reflecting – reflection in action and reflection on action. Reflection in action is all about reflecting and adapting in the moment such as adapting a coaching session mid-way to suit the changing needs of the participants. Reflection on action involves reflecting after an experience on what happened and why. This is what we’ve focussed our energies on at Shift as it’s where I believe we can make most impact in our work. 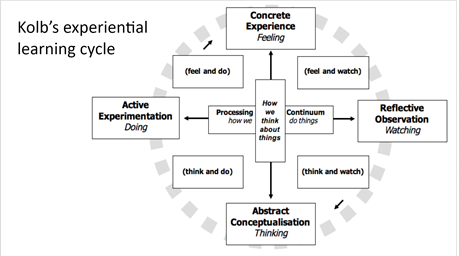 Kolb’s model of experiential learning is also helpful to consider and relates closely to the behaviours discussed in literature covering systems change and systems leadership, such as ways of being, doing, feeling, thinking, perceiving and relating. We can also use reflective practice as a tool to help us cope with change and I guess for systems innovation work, coping with the tensions which arise when we intentionally encourage change. 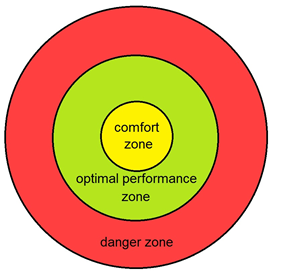 Karl Rohnke’s comfort/stretch/panic model is enormously helpful in understanding what’s going on when change is happening, as we move from our comfort zone into ‘stretch’ (where most learning and growth takes place) then perhaps beyond to the panic zone. If you go too far beyond the learning, your energy is used up by managing and trying to control your anxiety, so you’ve little or no energy left for learning. We don’t want to be spending too much time in the panic zone! In leading change in a complex environment, we spend a lot of time in the ‘stretch’ zone, learning and growing together. So, the notion of being comfortable with the discomfort created by ‘stretch’ is key to thriving during this journey, not just surviving it. Underpinning high quality reflection is the need for high quality thinking and this is most likely to take place when certain conditions are present. For reflection it’s all about ease, attention, appreciation and equality. Practicing ease, both for ourselves and each other is one of the most powerful things we can do, and often difficult to achieve when we first start trying. Jo describes ease as ‘soothing the urgency to contribute or interrupt’. How often, when listening to others think out-loud do we want to jump in with our own ideas, judgements and advice?! Oh, if only I could soothe the urge! Just those words make me feel more calm and ready to listen and I’ll repeat them as a mantra as I practice these skills in the weeks and months ahead. Jo’s approach has been to demonstrate the tools for reflective practice as we go and to let us experiment with the learning. Of most significance for me has been the rigour with which we’ve approached it – putting in place boundaries and rules to help us get the most from each opportunity. For example, timed thinking pairs, definitive questions and structured processes to follow in groups. We were introduced to Natalie Goldberg’s approach to wild writing which isn’t just crazy, unfettered indulgence. There are a set of rules to follow which are all about losing control and being free to write whatever you want without the worry of things like spelling, punctuation and grammar. Once we’ve done this, we are free to move on to another stage of clearer, more structured thinking. We also tried walking thinking pairs, which isn’t just a chat as you wander the streets outside. It’s intentional, structured, confidential, timed and enables us to hold space for each other whilst exploring our thoughts without interruption or judgement. It’s a luxury and feels like diving into an empty pool on holiday, bathed in glorious sunshine. Yet, if we create this space for each other as a matter of course, it will become normal and part of our culture. So, what’s the value of all this? What’s the relevance and how does this help us with Systems Change? The ability to create ease for each other, give attention, appreciate each other and establish equality in that space is, in itself a gift. When we find ourselves working in an environment of volatility, uncertainty, complexity and ambiguity (VUCA), these are tools which ought to serve us well and if practiced throughout the system, will keep on giving and help us build a culture of collaboration, confidence and trust. Additionally, if we’re able do this in a way which creates the conditions for high quality thinking, deep reflection and to help us re-frame and see problems differently, we’ll adapt quicker and will be more comfortable with the discomfort of change. As leaders, it’s so helpful to reflect on the things which make us uncomfortable, either as individuals or with teams and colleagues. By unpicking, pondering and gaining each other’s thoughts, we all see things differently and move forwards together. This is learning, real learning. For more information about our Reflective Practice workshops click here or get in touch using the contact form below.